The Greek Orthodox Ladies Philoptochos Society, Inc. was established in November 1931 by the late Ecumenical Patriarch Athenagoras I as the philanthropic arm of the Church. The successful establishment of the Society in New England took place at a Conference convened at the Annunciation Cathedral in Boston in July of 1955 with officers and members of the five greater Boston Philoptochos chapters. Today, the Metropolis of Boston Philoptochos Society is comprised of 42 chapters in the parishes served by the Metropolis of Boston. The word "Philoptochos", meaning "friend of the poor", aptly describes this multi-faceted organization whose philanthropy extends not only to families in need, the sick and the elderly, but to programs and institutions in our communities, our Holy Archdiocese and Ecumenical Patriarchate. The philanthropic endeavors of the Greek Orthodox Ladies Philoptochos Society is a genuine expression of love and Christian Charity. This expression of love is evident in the multitude of meaningful programs and services that reach those in need on a local, national and global level. The Metropolis of Boston Philoptochos invites you to the AGAPE Tea at St. Spyridon Cathedral at 2 o’clock in the afternoon to honor these women who embody the true spirit of Philoptochos: Presvetera Anthe Athas, Debra Ciejek, Bessie Condakes, Rhoda Economos, Marianna Koulisis, Venetia Mitropoulos, Bessie Papigiotis, Cleo Tsolas. Proceeds will benefit the Metropolis of Boston Philoptochos ministries including Philoxenia House, Metropolis Social Services Fund, Pine Street Inn, VA Center for Homeless Veterans, and St. Methodios Faith and Heritage Center. Tickets and sponsorships may be purchased by mailing the attached form (click here to access the form) to Elaine Zetes no later than October 12, 2018. We hope you are able to join us for this special event. Thank you for your support. The Metropolis of Boston Philoptochos has announced several events to open their new season. On Sunday, October 21, the Metropolis Philoptochos will host the AGAPE Tea at St. Spyridon Cathedral at 2 o’clock in the afternoon to honor these outstanding women who embody the true spirit of Philoptochos: Presvetera Anthe Athas, Debra Ciejek, Bessie Condakes, Rhoda Economos, Marianna Koulisis, Venetia Mitropoulos, Bessie Papigiotis, Cleo Tsolas. All Chapters and Friends of Philoptochos are invited to attend. Tickets can be ordered from Elaine Zetes. 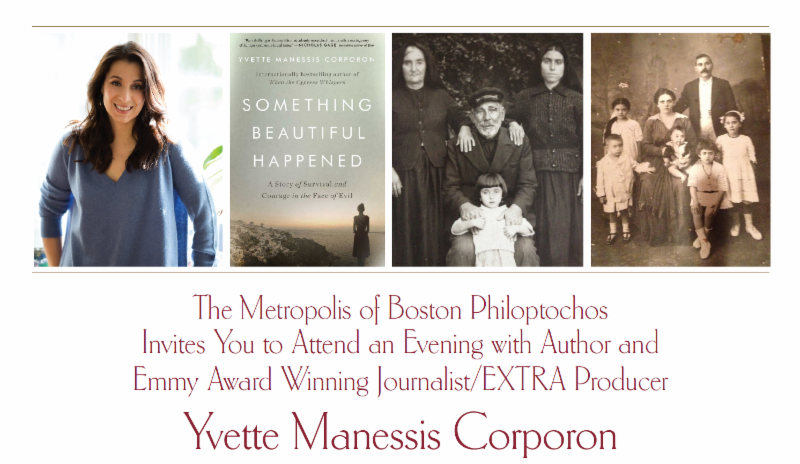 The Metropolis of Boston Philoptochos invites you to join us for an evening with Emmy Award-winning writer, producer and author Yvette Manessis Corporon. Yvette will discuss her new book Something Beautiful Happened: A Story of Survival and Courage in the Face of Evil which is the fascinating story of her grandmother who helped hide a Jewish family on a Greek island during World War II. 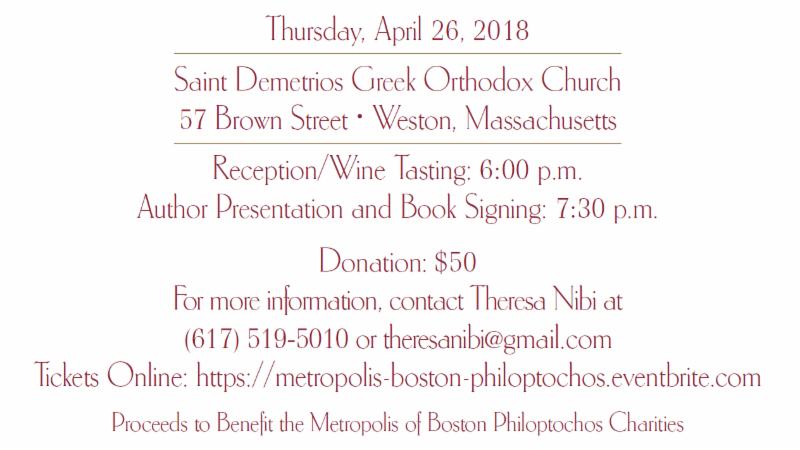 This event will be held on Thursday, April 26, 2018 at 6:00 p.m. at St. Demetrios Greek Orthodox Church in Weston, Massachusetts and will celebrate the memory of Fotini Tournas, the beloved sister of His Eminence Metropolitan Methodios and a generous supporter of our Philoptochos endeavors. All proceeds from this event will benefit the Metropolis of Boston Philoptochos ministries including, among others, National Children's Medical Fund, Philoxenia House, Pine Street Inn, VA Medical Center for Homeless Veterans, Metropolis Social Services Fund, and St. Methodios Faith and Heritage Center. Ticket purchases and sponsorship registration can be done on-line at www.metropolis-boston-philoptochos.eventbrite.com. 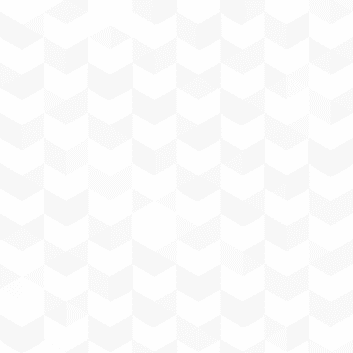 Alternatively, ticket purchases and sponsorships may be completed by returning the attached form (click here to access the form) by mail to Theresa Nibi no later than March 31, 2018.